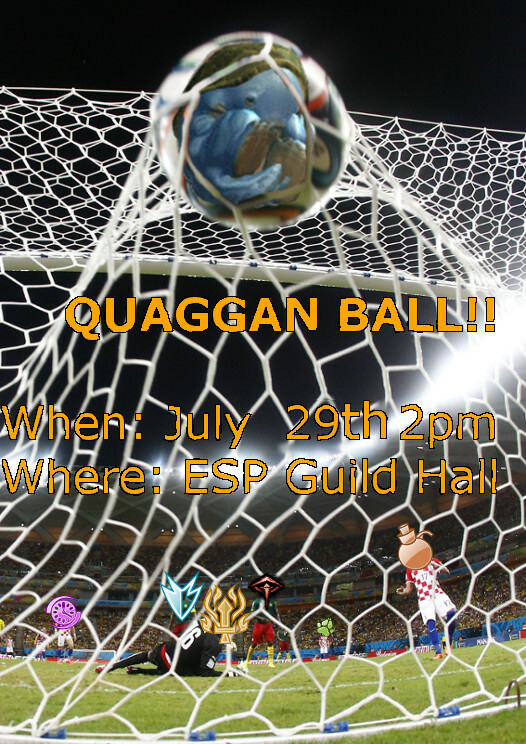 Home > Forum > Welcome to the Realm > Announcements > Quaggan Ball!!!! Quaggan ball has returned! WooHoo!!! It has been 2 years since we last played this amazing game and it is about time we returned to it! Anyone at any skill level can join in this fun game of our GW2 version of soccer/football. Just show up on July 29th 2pm at the ESP guild hall; no sign ups required! It plays just like soccer/football but a bit more silly and not as rule intensive. No fouls or offsides, but still has rules about when the ball goes out of bounds. Basic idea- get the Quaggan into the goal to score points! To "kick" the ball, you use knockbacks which is also used to defend your own goal! There is NO PvP involved as you will all join the same team. So, you can bring in a very low level character to play. The best way to play is with a guardian wielding a hammer. If you don't have a guardian, that is OK, we will set you up with the appropriate abilities to kick that quaggan! All players will only allowed to one weapon, except the goalie, which can use 2 weapons. Example, a goalie guardian can wield a hammer to knock the ball away but has the shield available for a small push back the encompasses the entire goal! Extra traits won't be needed and extra skills won't be allowed (unless that is the only source of good knockbacks your profession has access to).